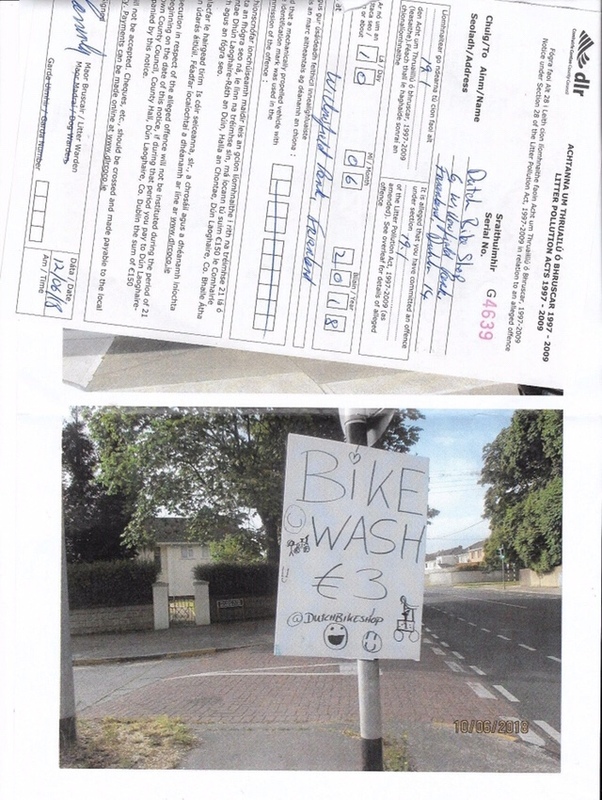 A family-run Dublin bicycle shop was hit with a €150 fine this morning after the owner’s children put up a poster advertising a bicycle wash outside the shop on Saturday. Astrid Fitzpatrick, who runs the Dutch Bicycle Shop with her husband Frank, arrived into work this morning with the €150 fine in their post with photographs taken on Sunday of the poster. It’s not clear if a litter warden or a member of the public took the photographs, but Astrid said whoever took the photographs, it should have been obvious it was drawn by a child. “Erin made just over a tenner on the day, and we get hit with a €150 bill,” she added. After publication we contacted Dún Laoghaire-Rathdown County Council for comment — if they reply this article will be updated. Oh for goodness sake! I would have thought that any public servant would be ashamed to put his/her name to such a notice. Can children be fined under this law? If children put that sign up without the knowledge of the parents (even if the parents were aware of the bike-wash itself, then who’s responsible? Surely the parents aren’t responsible for ‘criminal’ behavior of underage children? Or can they? Petty and thoughtless best describes this proposed fine, while at the same time cigarette butts abound on the pavements everywhere. Penalising kids for thsi kind of entrepeneurial action is CRAZY! I hope Astrid appeals and does not pay! Wait they fined you for the sign? Can i add a crayon sign indicating the civic office on the quay and hope they fine themselves? Typical idiot bureaucracy that has this country the way it is. Total shower of cabbages. Pay the fine, put it down to experience and move on. Don’t be swayed into going to court – whether you win or lose, it’ll cost you thousands in time and fees. That’s a higher fine than a driver faces under the FCN system for parking in a cycle track during its period of operation. Or come to think of it it’s higher than any of the array of FCN fines! Cheapest is €60 and highest €80. What a pathetic and humourless response to a very minor transgression . Clearly Dlrcoco are really hard up for money, something useful to do, or both. A quiet word in the ear of the parents would have been a perfectly reasonable solution to this “problem”. You should thank your local council for this. €150 for national advertising, cheap at twice the price. The law of unintended consequence applies. Buy this children IceCream all summer long.